CVS announced today that it will stop selling cigarettes and other tobacco products, stating that it is inconsistent with the company’s purpose of supporting health. CVS Caremark will remove tobacco products in all of its 7,600 stores nationwide by October 1st, 2014. The company currently generates about $2 billion in revenue from tobacco products. Ending the sale of cigarettes and tobacco products at CVS/pharmacy is the right thing for us to do for our customers and our company to help people on their path to better health. Put simply, the sale of tobacco products is inconsistent with our purpose. As the delivery of health care evolves with an emphasis on better health outcomes, reducing chronic disease and controlling costs, CVS Caremark is playing an expanded role in providing care through our pharmacists and nurse practitioners. The significant action we’re taking today by removing tobacco products from our retail shelves further distinguishes us in how we are serving our patients, clients and health care providers and better positions us for continued growth in the evolving health care marketplace. CVS/pharmacy is the first national pharmacy chain to take this step in support of the health and well-being of its patients and customers. When asked whether CVS would extend the ban to other products known to be unhealthy — candy or alcohol, for instance — Merlo told reporters those items, in moderation, do not have the same adverse effects as the use of tobacco. In a statement from the White House, President Barack Obama praised CVS Caremark for its decision to stop selling tobacco products, saying that the move “will have a profoundly positive impact on the health of our country.” Under the Affordable Care Act, smokers can be penalized with a premium surcharge if they seek insurance with state health exchanges set to open in October. 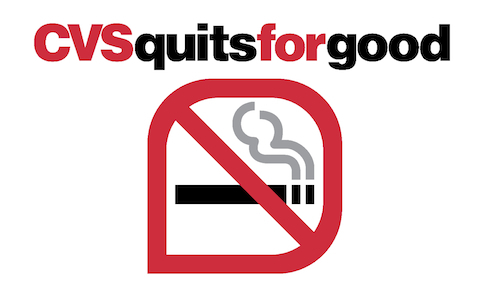 CVS’s decision to stop selling tobacco products is consistent with the positions taken by a number of health associations that have all publicly opposed tobacco sales in retail outlets with pharmacies, including the American Medical Association, the American Heart Association, the American Cancer Society, the American Lung Association, and the American Pharmacists Association. In addition to removing cigarettes and tobacco products for sale, CVS will undertake a robust national smoking cessation program to be launched this Spring. The program will be available at all CVS/pharmacy and MinuteClinic locations and will offer additional comprehensive programs for CVS Caremark pharmacy benefit management plan members to help them to quit smoking. In a statement from Walgreens Company, the nation’s largest drugstore chain, a spokesman said that the company has been “evaluating this product category for some time to balance the choices our customers expect from us with their ongoing health needs” but didn’t say that they had similar plans to remove tobacco products from their stores.